The Fashionable Fox recently started a new job, which called for adjusting to a new dress code. My office requires business casual clothing, which is a healthy combination of business apparel mixed with casual pieces. I can’t see going out and buying a brand new suit when I can find all different business pieces at Goodwill! And for obviously much, much less! 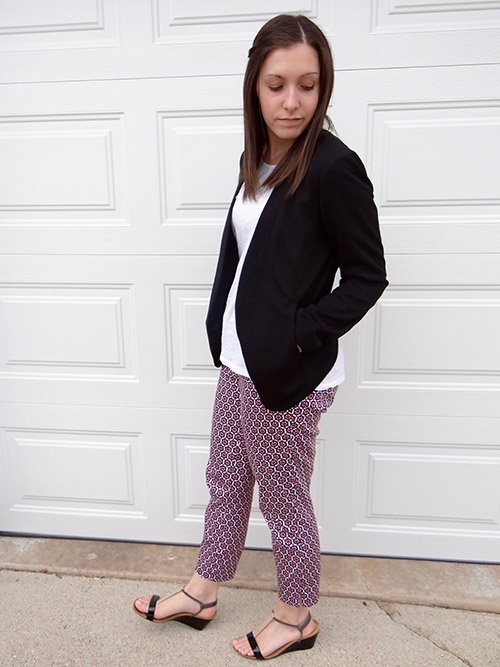 Mixing up pieces is my favorite way to create a business casual look. Certain occasions call for a matchy suit set, but for my work outfits, I have more freedom to play around. 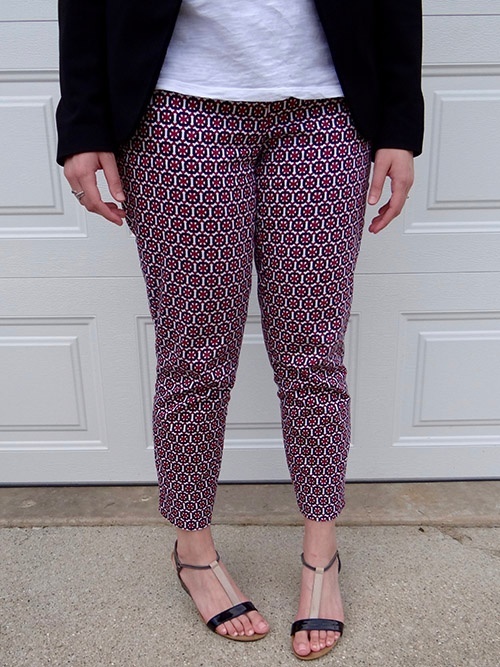 The pants are by Cynthia Rowley, which I found at GW for only $4.99. They are a busy black, white and hot pink pattern with a cropped ankle cut. My white top by Sonoma for Kohl’s was a $2.99 Goodwill find. I love the simple lace detail at the neckline, as well as how loose fitting the shirt is. The Apt. 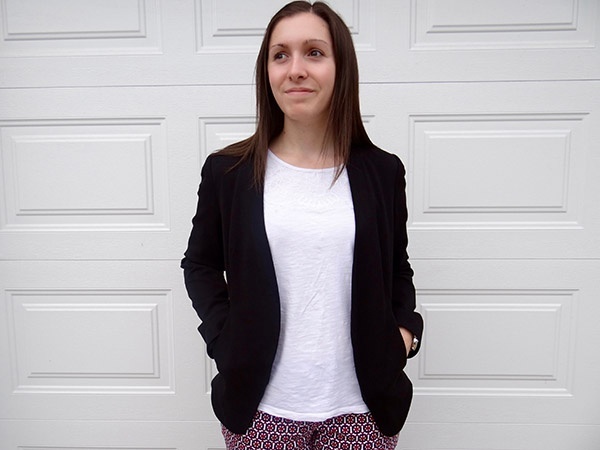 9 for Kohl’s black blazer is tailored perfectly to my body and has a subtle high-low effect from front to back. I found it for only $6.99 on the Goodwill racks. Finally, these Style and Co. for Macy’s patent wedges tie the outfit together. Only $4.99 for these color-blocked sandals. Plus, they are SO comfy! I slapped on a pink Fossil watch and was ready for the work day. I love that all of these pieces are different, but complement each other due to colors and styles. A business casual dress code is the best if you’re a fashionista like me. 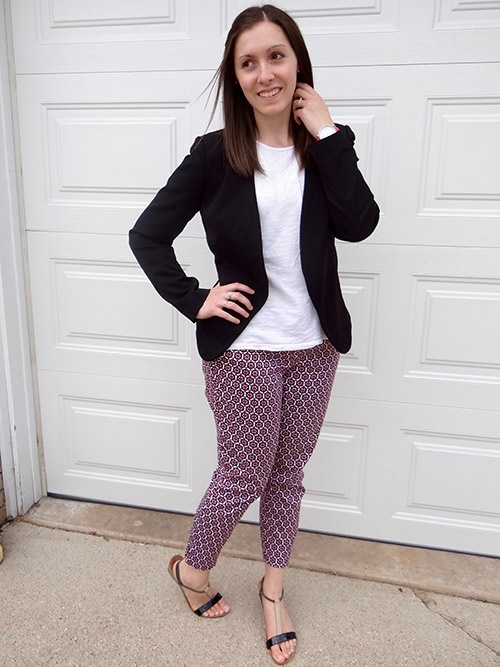 Instead of a full pants suit, I can mix up pants, blazers, cardigans, skirts and more to create a professional look that is having way more fun. If you are starting a new job, or just looking to spruce up your everyday office wear, Goodwill is the spot to find great business attire without having to work overtime. Until next time, shop smart and stay stylish!